So, you’re fresh out of high school, and you have your whole life ahead of you…except you have to get through college first. Well, I’m here to tell you that college isn’t all that bad. I’m three years in, and so I think I have gotten the hang of college things. College is much better than high school, and there are many things that make it better. 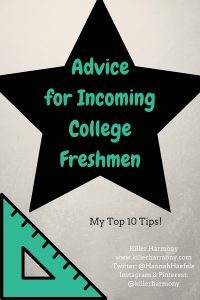 That’s a post for another day, but today, I’m going to give you some of my best advice for incoming freshmen! There are a lot of advice posts out there, and some of them seem to be misinformed about college. They say that you should go to every home football game or that you won’t have fun if you don’t go out partying every night. Those things may be true for some people, but I don’t agree with them. Here are my top tips for you! 2. Stay away from people if you get sick. No, getting sick is not something you want, but if you do, please stay in your room. Don’t go to class or walk all over campus coughing up a storm and blowing your nose every 5 minutes. It’s not good. If you do go anywhere, be sure you go to your campus’s health clinic. 3. Don’t pull all nighters regularly. I get it, you have a lot more freedom being away from home. Your parents aren’t there to tell you to go to bed or that you can’t go to the movies with friends. The thing is, part of living in the dorms means being your own personal nag. You won’t have anyone to tell you what to do after you graduate, so you should practice now. Also, regular all nighters just aren’t healthy. Get ya dang sleep! 4. Don’t be afraid to hold off on declaring a major…or changing it. A lot of people change majors nowadays. On paper, I have changed my major 5 times! 5 times! I went from entrepreneurship to liberal arts to Spanish to interdisciplinary studies to music performance to adding a Spanish minor. Now, you don’t want to put off picking a major for too long, but there’s really no rush. 5. Take a variety of classes. If you are stumped on picking a major, take a variety of classes that might interest you. Who knows, that random gen ed everyone complains about might just be your calling. Also, don’t just take a class because all of your friends are, unless it genuinely interests you! 6. Pick your extra curriculars wisely. I would recommend joining an organization that fits with your major/minor (or intended major) and one of personal interest. You don’t want to overload yourself with too many activities, but you should want to get involved at least a little bit. Also, certain clubs and organizations can help boost your resume. 7. Get your rules in writing. At my university, every dorm room with more than one person must fill out a roommate agreement so that if someone does something bad, you can reference the agreement to work it out. If you school doesn’t already require it, make a list of rules for you and your roommate(s) to follow. That way, if your roommate is playing loud music when you need to study, you can have more to back you up than just yourself. 8. Go to things alone. Sometimes your friends might be too busy to go to a concert, lecture, or other on campus event. Don’t be afraid to go by yourself. For one thing, you might see people you know there. If you don’t, going to things alone means that you don’t have to wait for your extroverted friend to stop talking to people you don’t know. When the event is over, you can stay or go. Your choice. Believe me. You will need a planner. You may have been able to get away with writing assignments down on post it notes in high school, but college is different. You want to keep everything organized so that you don’t go insane and have to stay up all night writing a paper you forgot about. If you want to try the Erin Condren Life Planner, click here. *Note: if you sign up through my link, you get a $10 coupon, and I get $10 credit, as well. These planners ain’t cheap, so I wanted to help you guys out! College is a pretty cool experience. At no other time will you be able to live down the hall from all of your friends, walk to all of your classes and appointments, or just be free to do what you want. As cheesy as it sounds, college is a unique part of your life. You don’t want to waste it worrying about the little things. Well, those are my top ten tips for incoming college freshmen! I hope you found them helpful. Entering college? What more do you want to know? I would love to write more posts for you guys in the next couple of months! Already in college? Did I miss anything? Brilliant! One of my school’s requirements was a “Roommate Contract” your freshman year— didn’t have to pull it out and reference the bylaws, but it was a great security blanket! Thank you! I love the idea of roommate contracts and will probably use one if I have to have a roommate (I lucked into a single dorm). I think that it is a good idea to be prepared in case a problem does come up. Most people, like you, probably hardly, if ever, need to reference it. It is definitely smart! Yes! I love the idea of joining different organizations, but part of college is learning how to budget your time. As cool as it would be to join the Beyonce Appreciation Club, unless you have plans to work for Beyonce, it probably won’t help you.